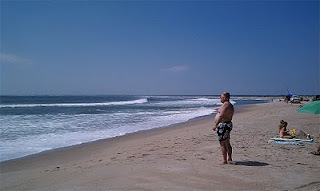 Bill's OBX Beach Life: Lots of Tropical Action to Kick Off OBX Sept! Well, the surf is finally here for Hatteras 2010 with a triple header lining up to end August and welcome September!! First there was Hurricane Danielle which offered up a fun weekend swell with great longboard and SUP action at the Cove in Buxton. On deck we have H Earl who is forecast to make a brush by the OBX Thursday/Friday. The forecast models have been all over the place with surf size ranging from 27ft to 12 ft and winds from 60+mph to mid-20s. The models will zero in as the second half of the week approaches, and hopefully the storm will remain well offshore and only throw us a fun sized swell as well as wind. Definitely do not want to see Mirlo/S-Turns and Rt 12 washed out again, especially leading into Labor Day weekend! Following Earl we have Invest 97 which is well out of the picture until the week following Labor Day. Hopefully, again a storm which shoots The Slot between Cape Hatteras and Bermuda and does not approach landfall. What a kickoff of the 2010 Hatteras Tropical Season! After a year of minimal surf, we are kicking into high gear! Now if we can also experience some ideal wavesailing wind (SW/NE in the 20 to 25 knot range) along with a long period swell..., what a lead up to Hatteras Wave Jam 2010!! Stay tuned for upcoming Hatteras Tropical coverage! We're right there with your thinking up here in Long Island. A friend sent me an email: "triple head high...STOKE!" I said "what are we going to do in waves that big except cry for mommy? !